Sean Murphy is answering the question "What would Jesus do?" in a very sci-fi fashion. 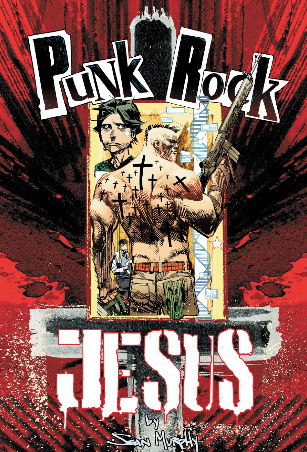 His new Vertigo Comics miniseries Punk Rock Jesus imagines a futuristic world of 2019 where the birth of a clone of Jesus Christ is the star of a reality show — called The J2 Project— and, as a teenager complete with Mohawk, rebels against the people and system that created him. The [first] book covers 14 years in the life of Chris, who is born out of a modern-day equivalent to the immaculate conception: Pieces of DNA are scraped off the Shroud of Turin, fused with an egg and are inserted into a virgin girl found via nationwide audition. There are to be four books in the series. Murphy says Punk Rock Jesus is autobiographical in a sense — he began writing it as a Catholic eight years ago when he was 23, but has since walked away from religion and is now an atheist. He admits that there wasn’t anything in particular that made him depart his Catholic roots, but five years ago he was a "militant atheist" and wondered if Punk Rock Jesus would ever be picked up. "I thought I would just be doing this book myself and it would be just a pure expression of how irritated and concerned I was about religion’s influence on government, things like that," Murphy says. "In the years since, I’ve kind of calmed down and read a lot and did a lot of thinking about the best way to approach people who are religious. "Sometimes having the ax to grind obviously isn’t the best place to get anywhere." The hardest thing for Murphy has been how divisive the book has been for him and certain members of his family, including his mom, a born-again Christian. "Certain parts of the book she’s OK with, but I’d be lying if I said she was happy with this. It’s made things kind of difficult," Murphy says. "But my wife is also religious and she’s got no problem with this and believes in it and believes I should do it."
. . . the punk musical aesthetic came out of pondering what would happen if the clone of the son of God became an atheist himself. Why was the Shroud hidden in a monastery during WWII? Yesterday, I came across this in Matzoh and Meatballs: Grandma said you can outgrow being Chinese. In the relatively recent past, my father, his brother, and the same aunt waiting for her adopted niece to outgrow Chineseness took a heritage trip to Calitri, Italy, to find our distant family. The trip was a success. They met first cousins, learned we are related to the man who hid the questionably mystical Shroud of Turin from the Nazis. . . According to an Italian monk, the real reason the Holy Shroud was hidden in a remote monastery in southern Italy during World War II was to protect it from the thieving hands of the Nazi dictator Adolf Hitler. Officially the famous linen cloth, also known as the Shroud of Turin and believed to have wrapped the dead body of Christ, was secretly sent south by its owners, the Savoy royal family of Turin, to keep it safe from wartime bombings. Now, on the eve of a rare public display of the Shroud, the Rev. Andrea Davide Cardin, the librarian at the Montevergine Abbey where the Shroud was concealed from 1939 to 1946, says it appears there was another reason to hide the holy relic: to keep it out of the hands of Hitler, who was said to be interested in the esoteric and the occult. Cardin, a Benedictine monk, told the Italian paper La Stampa that he was preparing an exhibit on the Shroud in his library when he came across a document that he believes shows the Shroud was actually hidden from Hitler. I missed that. Then, again, maybe both reasons are valid. Sometimes, just sometimes, Colin Berry talks sense. But. But. But. Do you know what? Sometimes, just sometimes, Colin Berry talks sense. Then he comes up with some ridiculous theories and thoughts that destroy any credibility he might have claimed. His latest nonsense concerns the 1516 Lire copy. He presents an argument along the following lines. The Lire copy shows minimal blood stains, only discrete ones on the palms of both hands and the side wound. He presents an argument that essentially the blood stains were added to the shroud over time, and the Lire copy showing discrete wounds consistent with the Bible was an early stage in the progressive re-interpretation of the shroud to incrementally show more blood wounds. He even throws up his bizarre Lirey Badge theory again, arguing because we can’t see blood wounds on what amounts to a tiny metal crafted badge that there was no blood on the shroud in the 1300s. This is nonsense, because the scale is too small to reasonably show bloods wound, although it does show the blood across the bottom of the back of Jesus, which Berry inventively (I’ll always give him points for creating novel theories, even if they are nonsense) calls a chain. In my opinion, an explanation for the differences in the Lirey copy from the shroud that is FAR more likely is that the Lirey copy’s differences are due to the artist wanting to show the hand wounds in accordance with conventional artistic depiction. Similarly representations of Jesus through the 1500s / 1600s were typically non-gory, hence the very limited and discrete depictions of key (in the sense of the Gospel accounts) bloody wounds. As I have stated here before, there is a limited period in German art from about the late 1300s to the late 1400s that shows Christ’s body heavily wounded, and one or two other curious examples, such as the epitaphios I mention above. Otherwise minimal and discrete wounds are the norm. Indeed other copies demonstrate “reinterpretation” of the shroud to suit their audience. For example, most copies show Jesus wearing a loin cloth, to protect His modesty. Obviously, His image on the shroud does not include a loin cloth. A Colin Berry le sobra SAGACIDAD……pero le falta CONOCIMIENTO. En 1534 el Papa Clemente VII ordenó al cardenal Luis de Gorrevod que verificara el estado de la Sábana Santa tras el incendio de 4-XII-1532. La verificación se celebró el 15-IV-1534. Se abrió la caja-relicario que contenía la Sábana ( desde el incendio NO se había abierto al parecer por temor de que se hubiera destruído), se extendió sobre una mesa y 12 testigos que conocían bien la Sábana Santa, la habían tocado y mostrado al público antes del incendio, testificaron que era la misma Sábana que ellos conocían con anterioridad al incendio. Y esa Sábana anterior al incendio de 1532 ( la copia de Lier es de 1516) ya MOSTRABA las manchas de sangre que nosotros conocemos. Existe un precioso documento escrito por la Abadesa del convento de las clarisas de Chambéry, Louise de Vargin en que se relatan los hechos de la reparación de la Sábana y su descripción e incluso la interpretación de lo observado. Las monjas clarisas estuvieron en contacto permanente con la Sábana durante 15 días, si bien sólo 4 monjas podían tocar y remendar la Sábana ( entre ellas Louise de Vargin). 1.- La enorme IMPORTANCIA que tenía la Sábana Santa como RELIQUIA para la Iglesia Católica. 2.- La presencia de las MANCHAS de sangre en los sitios en que hoy las conocemos. Colin Berry [ ? ? ? ] lacks knowledge. In 1534 the Pope Clement VII ordered the Gorrevod Luis Cardinal that verify the State of the sheet Santa after the fire of 1532-XII-4. The check was held 15-IV-1534. Opened the caja-relicario containing the Savannah (from the fire not had opened apparently fearing that had destroyed), spread on a table and 12 witnesses who knew well the shroud, it had played and shown to the public before the fire, testified that it was the same sheet they knew prior to the fire. And this sheet before the 1532 fire (the copy of Lier is 1516) as showed the blood stains that we know. There is a precious document written by the Abbess of the convent of the Poor Clares of Chambéry, Louise Vargin that relate the facts of the repair of the savanna and its description and even the interpretation of what was observed. The poor Clare nuns were in permanent contact with the Savannah for 15 days, while only 4 nuns could touch and mending the Savannah (including Vargin Louise). 1. The enormous importance that had the shroud as a relic for the Catholic Church. 2. The presence of the blood STAINS in the places in which today we know them. A reader tried to comment on Paper Chase: Thibault Heimburger’s Paper on the Maillard Reaction Hypothesis. It wouldn’t take any he suspects a bug. I tried to post it for him and it wouldn’t take; I have no idea why. “I was quoting Rogers conclusions and asking Thibault for more details concerning Rogers hypothesis (presumably given in a long SSG message) as he suggested,” he writes. Some years ago, Rogers wrote a very long SSG message to explain step by step his hypothesis and the many parameters. I will try to summarize this message later. 1/When temperature is too high, convection cells are too active, and resolution is low. A body that had cooled would give better resolution than a hot body. I think Rogers first thought high body temperature was needed for two main reasons : vertical convection cells, and a temperature gradient on the shroud, making temperature the main parameter to explain high resolution since he thought reactive amines came from the lungs (and don’t forget he was a thermal analyst). Then he tested his hypothesis, came back on this idea, and admitted a lower body temperature would better suit high resolution. Anisotropic heat flow, may be a second order parameter. 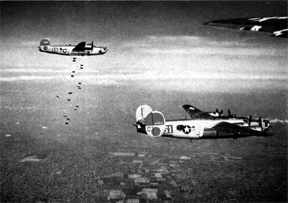 2/The amine must be released slowly. Two much amines badly reduced resolution. Porosity – Adsorption properties of the shroud : a low flow of amines can diffuse through the cloth, a high flow of amines is blocked and flows along the cloth. This is consistent with a slow production of ammonia through hydrolysis of urea on the skin for hours (your article on the origin of the reactive amines). 3/The atmosphere must be cool and still. No external convection flows. Convection blurs the image. 4/An increase in the concentration of reducing saccharides improves resolution. It improves contrast. Indirectly, it allows a lower amount of reactive amines, thus a lower flow. From time to time I’ve drawn attention to some list of top ten or top five mysteries, which invariably includes the Shroud of Turin. 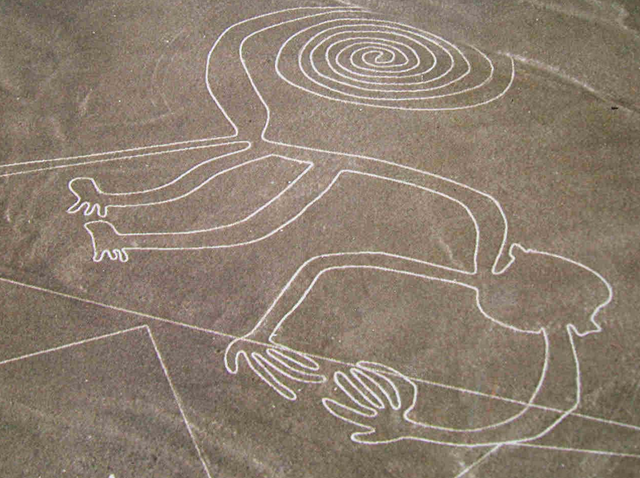 Another list, 5 greatest unsolved enigmas of humanity, just popped up on a blog called Learning Mind. It is interesting. And if I find the time, I might read more about these first four items. I think I have heard of some of them or all of them at one time or another. Although the Vatican has affirmed that it is not authentic, the Holy Shroud remains an unsolved mystery of humanity. It is a shroud on which is imprinted the image of a bearded 33 years old man. Throughout the fabric there are signs of blood, which proves that this man was crucified and then his body was covered with this cloth. Understandably, many believe it is the burial cloth of Jesus Christ in which the body was put after the Crucifixion, as the weave of the fabric refers to the epoch he lived in andthe signs of blood confirm the death in the same manner as that of Christ. The Vatican has affirmed that it is not authentic? Really? A bearded 33 years old man? Pray tell, how did someone determine the age? Was it the beard? It must be Jesus if the image is of a 33 years old man. And these amazing tidbits from wherever continue. Can anything written about any of the other mysteries in this article be trusted? 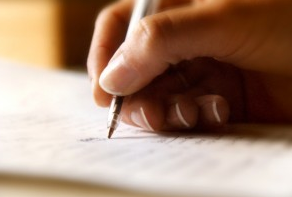 Can you trust anything you read in a blog? Since I know that you follow closely all that is written on your great blog, I’m sure you’re aware that I was working on a complete article based upon my recent open letter published on your blog some months ago. Because of the good reactions I get at that moment, and also because I noticed that the very good website of Pete Schumacher (shroudnm.com) had published a link concerning this open letter, I thought it would be a very good thing if I could make a more complete work to really emphasize the fact that science have proven long ago, especially when we look closely at all the data coming from the bloodstains, that the Shroud COULD NOT be any form of artistic forgery. So, now, after a very high amount of hours, the work is completed !!! I give you in an attach file the complete article (the English version) in PDF format. This time, the quality of the English is very good because I had the help of Andy Weiss, the webmaster of Shroudnm.com !!! I’m so glad that this article is in a very good shape concerning the English because I will have the opportunity to propose it for publication to all the known Shroud website on the internet. And the big news is this : Shroudnm.com have already publish it on their website ! And guess what ? In a near future, there will even be a Spanish version of the same paper on this website !!! Great don’t you think ??? That’s the main reason why I wrote you this email : Because I want to ask you kindly if you could just wrote a news about that and give those links for the English and French versions of my article… I’m 100% sure that you will help me to share this article (the best I’ve ever wrote about the Shroud) with the world !!! Thank you in advance for your very good support !!! To conclude, I just want to say this : Have a nice reading of my paper and don’t be shy to comment it to me via an email and/or to comment it directly on your blog !!! I’m almost sure that you will really love it !!! And be sure that I did it with honesty and with passion !!! Now, I’ll wait for you to help me sharing this article with all the persons interested by the question of the authenticity of the Shroud !!! P.S. : In the news you can put on your blog about this article, it would be great if you, at least, can say that the main goal I had while writing this paper was, like I said in the beginning of this email, to emphasize the fact that science have proven long ago, especially when we look closely at all the data coming from the bloodstains, that the Shroud COULD NOT be any form of artistic forgery, but instead, it is a real burial cloth of a real tortured and crucified man who has bled a great deal prior to his death and who show all the stigmatas of Jesus of Nazareth during his Passion, as reported by the Gospels. 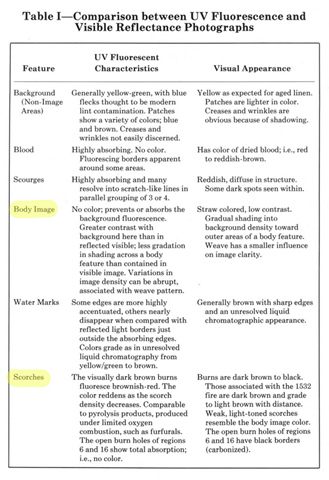 Is the non-fluorescent body image on the Shroud of Turin a valid indicator? The non-fluorescent body image on the Shroud is a pale sepia colour. It may or may not have been the result of mild scorching (I happen to believe it is a light scorch). But the fluorescent, heavily charred regions on the Shroud are the result the 1532 fire etc. There is no inconsistency whatsoever between these two findings. All that remains to be done is to offer an explanation as to why one fluoresces and the other does not, ensuring that it is a TESTABLE and potentially FALSIFIABLE explanation, i.e. a SCIENTIFIC explanation. Note the aromatic benzenoid ring systems, prime candidates for fluorescence under uv radiation. Reminder: the margins of the heavily-scorched, indeed carbonized, holes in the Shroud linen(1532 fire etc) exhibit a red fluorescence. Aromatic ring systems with delocalisation of π-bonding p- type electron clouds frequently fluoresce under ultraviolet light. 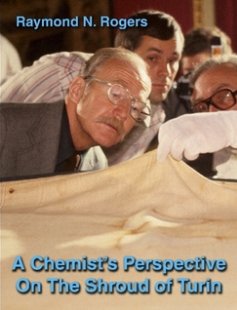 However, the temperatures that produced the sepia image on the Shroud were not high enough to char and carbonize cellulose. Indeed, they may not have been high enough to affect the cellulose at all. 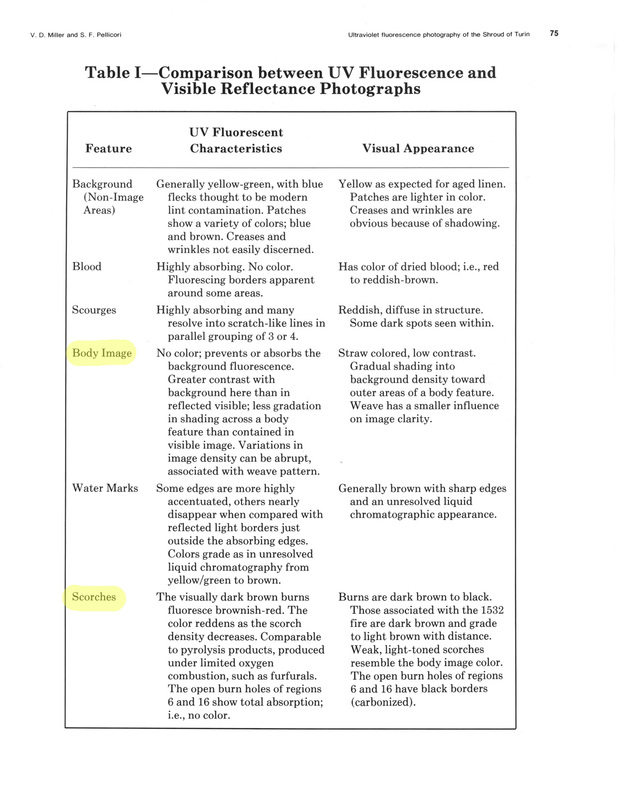 They may have affected primarily or exclusively the chemicallymore susceptible hemicelluloses of the primary cell wall (accounting for the superficiality of the Shroud image). PS It’s instructive to read Barrie Schwortz’s two comments in full. “I think everyone is forgetting an important fact. The idea of the Shroud image being the product of scorches caused by a heated metal statue has been around for a long time (since the STURP days), and was first proposed by Joe Nickel, avowed atheist and Shroud skeptic. Note his preoccupation with copyright issues, even when discussing a crucial scientific point re the Shroud’s authenticity. Has BS, described today as “copyright expert” (oh yes indeed) never heard of “fair use” waivers– designed to ensure that copyright is never used to gag genuine disinterested researchers, like this one? As I said in my last post, what BS did in February was nothing less than a guerrilla hit-and-run tactic, deploying what he thought was good STURP science, but which in his hands translated into flawed logic and defective science. Maybe BS should stick to his photography – jealously guarding and indeed extending that copyright portfolio of his and STERA’s – leaving the disinterested science to us disinterested scientists. Technical footnote: what a delightful and unexpected mechanism that is for carbonisation of cellulose. Ask anyone how they pictured the process at the molecular level, and I’m willing to bet they would imagine it to be one in which the hydrogen and oxygen are driven off to leave a carbon skeleton. In other words 0ne polymeric matrix – cellulose fibres – gradually transforms into another – charcoal. 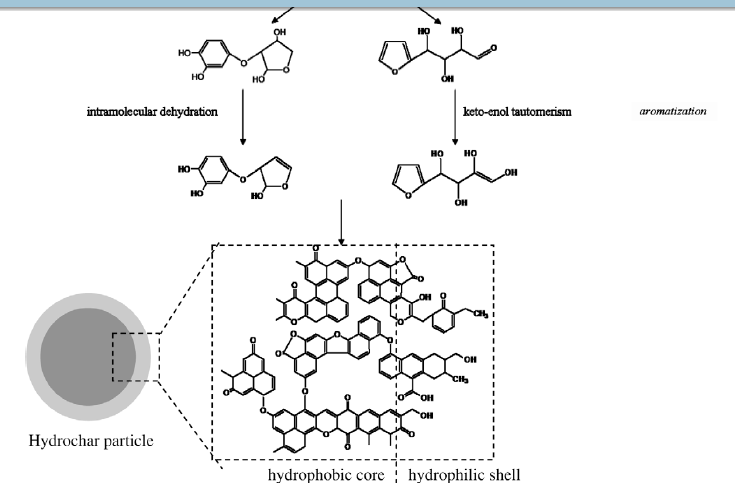 But as the diagram reveals, that is not the mechanism: cellulose becomes fragmented into small reactive molecules with 5 or 6 membered rings, and the latter then gradually undergo condensation reactions to produce tars and resins, and finally a ‘hydrochar’ particle. Chemistry is full of surprises. For the complete stink bomb click here.